Our executive King rooms are larger than other hotel rooms. They have a king bed with microwave and refrigerator, telephone, 32"flatscreen TV, desk and office chair. 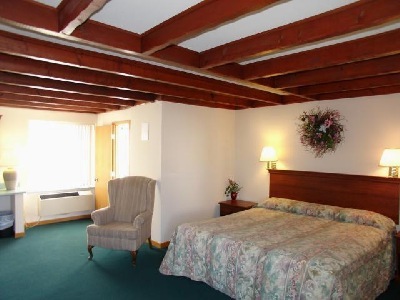 Our beamed ceiling gives the room a quaint atmosphere. The windows overlook the subdivision behind the hotel, instead of a parking lot. Each room has a Kohler tub/shower combination with Corian shower stall. The bath has a tiled floor and pedestal sink. All rooms open into our atrium hallway that leads to the Fireplace Lounge. All rooms have free WIFI, Parking, morning coffee and breakfast breads.